It is not rare that a projecting chin (too much advanced) or reducing (too much moved back), is the source of real sufferings which affect the social life or the psychological good being of an individual. The genioplasty makes it possible to modify the shape or the position of the chin; this intervention is realizable only once the completed osseous growth. The correction is realizable by the installation of a silicone implant or by an osseous Clerc's Office during which the point of the chin is avancéeMenton projecting: The correction is done by reduction of osseous excess on the point of the chin. 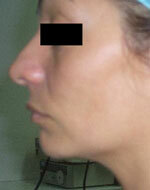 Can be reduced by a lipoaspiration alone or associated a reduction of the excess of skin has. according to the situations the incisions can be practised inside the mouth (invisible scars) or seldom practised under the chin (very discrete scar). The genioplasty makes it possible to have a harmonious face. After intervention, it is traditional to have an oedema and bruises of the cheeks and lips which reabsorb naturally at the end of a few days; the mobility of the jaw can be blocked during a few days. In order to support the cicatrization, it is imperative to have an irreproachable hygiene bucco dental, to avoid the too hot, too cold or too spiced dishes, stop tobacco, alcohol and irritating drinks. The results start has to be visible at the end of a few days and are really appreciable approximately 3 months after the intervention.